The Springfield Armory experienced many changes during the Second World War. Like many other factories across the country, it began employing women to take the place of soldiers fighting the war abroad. While the women employed at the Armory did not work there long, they did leave a legacy that remains today. Whether these women were married and running households, living with their parents, or patiently waiting for their fiancés to return they all had one thing in common: they all did their patriotic duty by working in factories and dreamed it would be a quick end to the war abroad. For the young women at the Armory whose fiancés, boyfriends or husbands left them to serve their country, working in the factory offered benefits aside from steady pay. These women did their best to produce weapons to ensure the safety of their beloveds. These women toiled to remain focused that their loved ones would return after the war’s end. During the Second World War, the government advertised for women to do their patriotic duty and take factory jobs. Posters like the one labeled “Longing won’t bring him back sooner… GET A WAR JOB!” depicts a beautiful young woman holding onto letters written by her husband while he is away at war. The message for women at this time was clear: your husbands need you to stay strong, get a war job, and to wait for them to come back to you. Women at the armory took this message very seriously and all of them found different ways to cope with the day-to-day of living during war. The workers tried their best to keep their lives as normal as possible as a way of coping with the war. They did this by decorating their issued uniform, the ‘womenall’ and continuing to pinup their hair, and put on their makeup and jewelry every day. 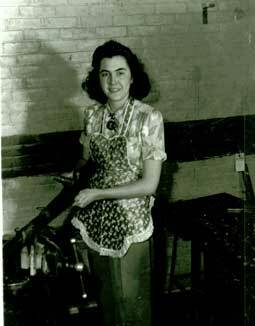 Women who had loved ones overseas honored them with their work in the factories. To help these women’s femininity, designers started advertising a ‘new look’ in fashion. They encouraged women to revamp their old clothes and mix and match the outfits they already had to ration material for military use. Headscarves, like the red scarf at the armory, became a fashionable accessory that recycled old clothes. The war dictated many fashion decisions for women. For these reasons the women at the Springfield Armory lived their lives like the war was not affecting them, because they needed to stay strong for the soldiers. As patriotic American women working for their country and their soldiers, they woke up everyday, put on their makeup, their red headscarves, their good pearls and their ‘womenalls’ and headed off to the factories. There they toiled all day making rifles because they knew that by doing so they helped their lovers to remain safe. They revamped their wardrobes and adhered to rations. 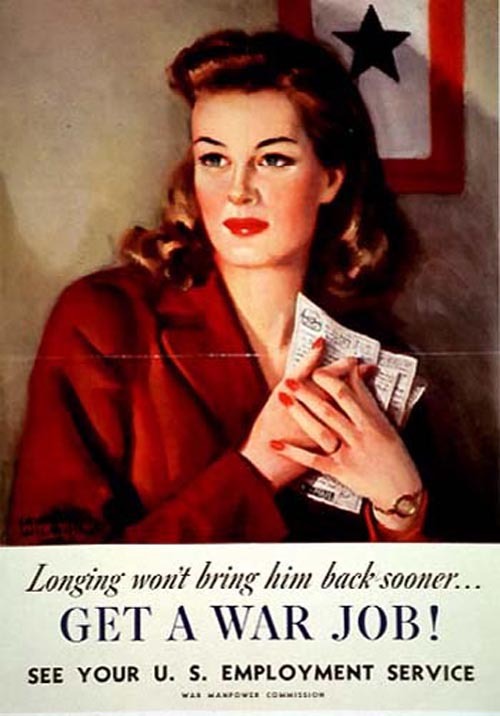 The women of the armory banded together to help every young woman get through the war, as the poster reminds them, longing won’t bring him back any sooner.